Adventuress and butterfly hunter Veronica Speedwell has three rules by which she lives to ensure that her love life remains simple. She never permits herself to become involved with Englishmen or any other men who reside in her home base of England. She never becomes entangled in relationships with men who are married or betrothed. And finally, she never corresponds with her paramours once she returns home. While a modern woman might not need these guidelines, the Victorian times in which she lives dictate that Veronica keep her romantic adventures under wraps lest any rumors reach the ears of those back home and ruin her reputation. "[T]his opening installment seamlessly combines elements of romance and mystery to create the perfect fictional cocktail that goes down smoothly and warms readers from the inside out as they curl up with it on a cool fall day." Having just spent several months nursing her Aunt Nell through her final illness and seeing her properly buried in the local church cemetery, Veronica is set to strike out on a new escapade. Before she can do so, however, she finds herself nearly abducted by a violent intruder. Saved by her own wit, bravery and cunning, along with the intervention of a mysterious German baron, Veronica finds that her plans to escape England are indefinitely delayed. Raised as an illegitimate orphan by her guardians, spinster sisters Nell and Lucy Harbottle, Veronica always referred to the women as Aunt Nell and Aunt Lucy. Now that both have succumbed to final illnesses that dispatched them to the great beyond, Veronica is alone in the world. Resigned to never knowing where she came from, Veronica is astonished when Baron Maximilian von Stauffenbach asserts that he knew her mother well. Unable or unwilling to reveal more information to Veronica at that time and convinced that she is in mortal danger, the baron deposits her for safekeeping with one of his closest friends, Stoker, a crotchety natural historian and taxidermist who sports long black hair, a rakish beard, an eye patch and a gold hoop earring, and is primarily concerned with his own problems. When the baron is murdered before he can return for Veronica, Stoker whisks her out of London to the safety and obscurity of the countryside. Shocked to find herself in the midst of a traveling show complete with a fat lady, a giant, Siamese twins and other unusual characters, where she must pose as Stoker's wife, Veronica throws herself wholeheartedly into this new adventure. Unfortunately, those who pose a risk to Stoker and Veronica are closing in, and the couple find themselves on the run once more. In spite of their innate distrust of one another, they must join forces and learn to trust each other in order to survive, find out where Veronica came from and learn who she really is. In doing so, they both become aware of a powerful attraction that draws them together while every outside circumstance seems destined to tear them apart. 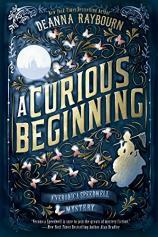 A CURIOUS BEGINNING is the magnificent first book in Deanna Raybourn's new mystery series. 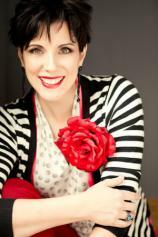 Filled with memorable characters, a heroine who's anything but conventional and a hero who makes every woman's pulse race, this opening installment seamlessly combines elements of romance and mystery to create the perfect fictional cocktail that goes down smoothly and warms readers from the inside out as they curl up with it on a cool fall day.